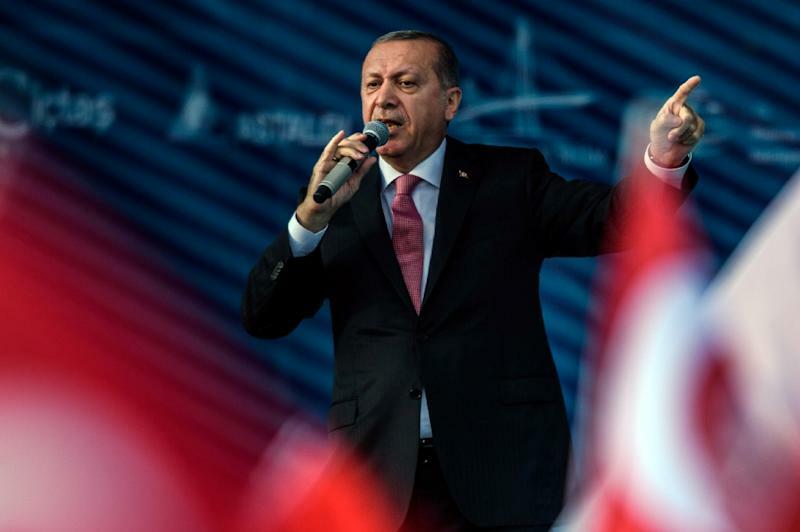 Istanbul (AFP) - Turkish President Recep Tayyip Erdogan vowed Sunday to devote equal energy to combatting Islamic State jihadists and Syrian Kurdish fighters, on the fifth day of a major offensive that has left dozens dead. "We will make any kind of contribution to the work to clear Daesh (IS) from Syria," Erdogan told a rally in the southern city of Gaziantep, near the Syrian border. "For the issue of the PYD (Democratic Union Party) terror group in Syria, we have just the same determination," he added, referring to the main pro-Kurdish party in northern Syria and its People's Protection Units (YPG) militia. On Sunday, Turkish forces ramped up their offensive, with Turkish warplanes and artillery pounding areas held by pro-Kurdish forces close to a town liberated from IS this week. Ankara said its raids had killed 25 Kurdish "terrorists" and that the army was doing everything it could to avoid civilian casualties. But the Britain-based Syrian Observatory for Human Rights said at least 40 civilians were killed in strikes on two areas -- the first report of significant civilian casualties since the start of operation "Euphrates Shield." The monitor also said at least four Kurdish fighters had been killed and 15 injured in the bombardments south of Jarabulus, the town taken from IS by Turkish-backed Arab rebels on the first day of Turkey's incursion Wednesday. Addressing thousands of flag-waving supporters in Gaziantep, Erdogan said he was "ready and determined to clear our region of terror groups". "We will absolutely not allow any terror activity on or near our borders." Gaziantep is the city where a suicide bomber blew himself up in the middle of a wedding party last weekend, killing 55 people. Turkey blamed the attack on the Islamic State group. Erdogan reaffirmed a previous statement that the bomber was a child aged just 14. Days later Ankara launched the two-pronged Syria operation with the stated aim of clearing the border area of both IS and the Kurdish fighters. Turkey sees the US-backed PYD and YPG -- which have links to Kurdish rebels in southeast Turkey -- as terror groups and wants to keep them from taking control of the border on the Syrian side. The US supports the Syrian Kurdish fighters as an effective adversary of IS in the area.